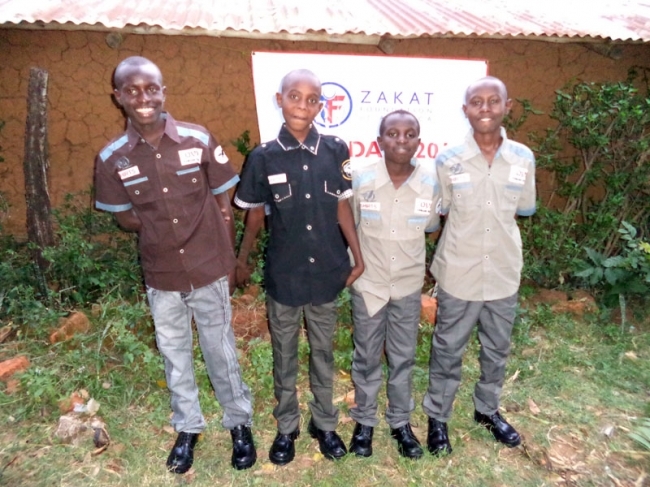 ZF gave the gift of new clothing to more than 100 orphans and vulnerable children in Kenya and Uganda during Ramadan this year. The boys’ clothing packages included shirts, long pants, socks and a pair of shoes. Girls received a hijab, dress, skirt, blouse and shoes. ZF has been working in the region since 2010. Coordinator Mohammed Wangusi reports that children often go about their day almost completely unclothed. If a child is lucky she may wear as a dress an old torn blouse handed down by her mother. Although better than nothing, this garment affords little dignity or protection from dirt, insect bites or infection as the children work, play, fetch water or rest on the ground. So the gift of a complete outfit brought tremendous joy to the children who received it. The children are now protected from harsh weather, biting ants and infections on their feet and legs. Children’s clothing limitations may interfere with school, and they may feel embarrassed to go to market, pay visits to friends or see a doctor. To bring joy and comfort to children in need, calculate your zakat and donate here.